24x42x42' Concrete, stainless steel 17x2x21' The original limestone pointer and 'Eutin' flower were vandalized and replaced by stainless steel pointer and cast concrete flower. A bronze dial about 2 feet in diameter that has a simple chapter ring with Roman numerals. The gnomon is an artistic extension of a bird. 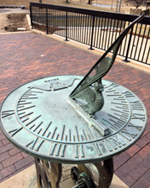 The sundial sits atop a 30-inch pedestal of open ironwork reminiscent of a clock tower. Cogs put together inside the open structure at the bottom reinforce this impression. All sits on a square concrete dais.